"Behold! I shall be a blight upon the land and everything I touch shall wither and die"
This is my pet deck for several years now. I started building it in 2006 and posted a semi-complete version here a year later. It started out with The Rack Buy, Skittering Skirge Buy and Smokestack Buy which were eventually replaced with better cards. Over the years, the deck has been tweaked over to the version you see today. Even now, the deck is still undergoing minor changes depending on what cards I want to try. Hit them hard and fast with disruption. The deck's ultimate goal is to cast a flurry of disruption spells, either as LD or discard, during the first few turns of the game in order to destabilize and set my opponent back several turns. Cards like Duress, Sinkhole, Hymn to Tourach and Smallpox take cards away from my opponents and this retards their ability to play proper Magic. With all the disruption in this deck, it is likely that I leave my opponents either without lands or without a hand; sometimes both. Since while disrupting opponents, I typically send a lot of cards to my graveyard, Tombstalker is the perfect card in this situation to execute the kill. Turn 3 Pox followed by a turn four 5/5 demon is a potent clock. 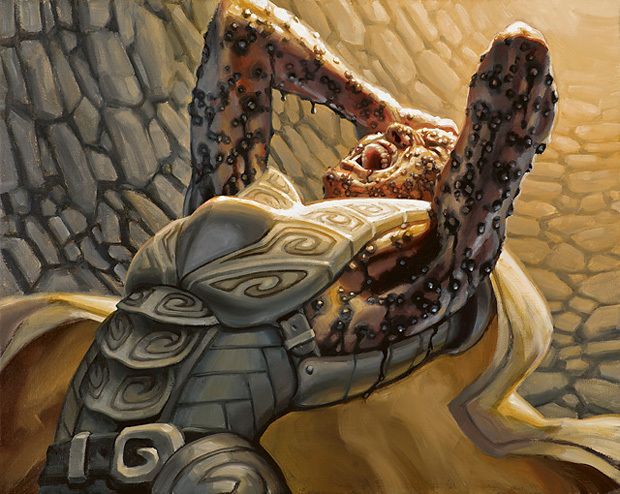 Pox is the premier disruption piece. Spreading disease is fun. As is hitting three different types of resources with a single spell. The life loss also helps in ending games quickly, turning my demons into three turn clocks with a single casting of Pox. Pox is at its best when my opponent has four lands in play and four cards in hand, conditions that are usually met against control decks. In addition, the deck is configured to avoid/break the symmetry of Pox. The low mana curve, the use of 23 lands, cards like Bloodghast, Crucible of Worlds and the Delve mechanic of Tombstalker all contribute to ensure that while my Pox effects devastate my opponent, they leave me relatively unscathed. On the subject of power: Obviously the deck is not a tier one Vintage deck and it isn't meant to be. Most of the other Vintage decks I face are either unpowered versions of the top tiers or janky metagame decks built to prey upon the unique landscape of Vintage without the Power 9. It is for this environment that this deck is made for. Sideboard: Used to shore up weak matches specifically powered decks, swarm aggro, decks with planeswalkers and Aether Vial along with graveyard decks.